CAMBRIDGE — It takes practice to perform the voice of Piggie from the children’s book series “Elephant & Piggie,” and Jennifer Gordon, the librarian at Benjamin Banneker Charter Public School, nails it every time. She works so hard at the “Piggie” voice, one student said, that it leaves her hoarse. On Tuesday morning, the school erupted in celebration as Gordon, 41, was presented with a national teaching honor and $25,000 unrestricted prize during a surprise presentation that was sprung on her and the student body by the Milken Family Foundation. Gordon, who holds a master’s degree in library science, is the 45th Massachusetts recipient to receive the Milken Educator Award, said Jane Foley, senior vice president of the awards program at the Milken Family Foundation in Santa Monica, Calif. The honor, which was first presented in Massachusetts 21 years ago, has been called the “Oscars of Teaching” by Teacher magazine, the foundation said. 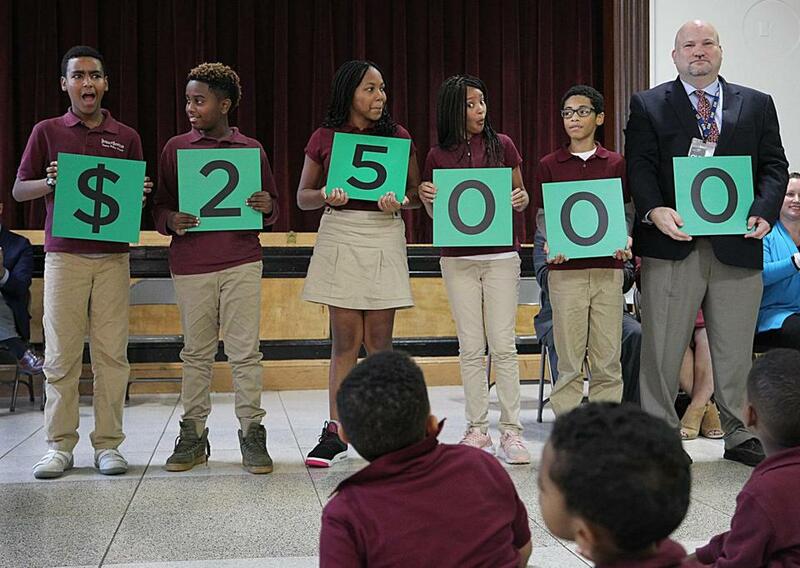 Students at the Benjamin Banneker Charter Public School reacted to the dollar amount about to be awarded to librarian Jennifer Gordon. The foundation has a confidential selection process and doesn’t accept applications or nominations for the honor, Foley said. She said the foundation recognizes educators who use innovative practices, show leadership, and help their students achieve. Following the ceremony, students swarmed Gordon. Gordon said she believed the assembly was convened for the school to meet with top education officials, including state Elementary and Secondary Education Commissioner Jeffrey C. Riley and Education Secretary James Peyser, who attended. She said she helped the school prepare for the visit from Riley and Peyser and spent much of the gathering recording the assembly with her smartphone. “I’m extremely honored and still shocked, completely shocked,” said Gordon, who has worked at the school since 2001. Students meet with Gordon weekly in the library, which is housed in a former church rectory separate from the main school. About 350 children from preschool to sixth grade attend the charter school. Sherley Bretous, the school’s executive director, said she credits Gordon with getting her son, Dwear, hooked on books when he was in the third grade. “He’s a freshman at UMass Lowell and every year for Christmas I just get a list of books he wants,” Bretous said. Cheryl Rateau, 11, who is in sixth grade, said she is reading “The Wild Robot” book series with Gordon. “She picks a book that all of us will love,” Rateau said. Librarian Jennifer Gordon (bottom right) is embraced by her students after she received a Milken Educator Award.